Rolex Single Red Sea-Dwellers do not require an introduction, do they? These particular watches with the rare 500 metres denomination on the dials are without doubt the horological super bad boys of professional diving. Some of these watches were present when a handful daring adventurers fullfilled their dream of becoming free agents of the sea in the late 1960s. The name Sea-Dweller was directly derived from the activity of the Aquanauts: “dwelling” at the bottom of the sea. Sometimes for days, weeks or even months. Diving was no longer just an enjoyment for an hour or two. The Aquanauts, pressurized to the same pressure as their underwater environment, could go in and out of their habitat through an open hatch, just as they pleased. Decompression after each dive was not required. The prolonged duration of these programs might be one of the reasons why Rolex decided to equip the Sea-Dweller with a date complication. The Aquanauts needed to know which day it was. Having a date on a diving watch was apparently such big deal for Rolex, they even had the word “Date” printed in a larger font to highlight this feature. Most of these early Sea-Dwellers don’t have a gas escape valve, the very feature which makes a Sea-Dweller ultimatelly a Sea-Dweller. The gas escape valve was only necessary when living in a helium saturated environment, in order to prevent the watch from damage during decompression. Tektite 1 for instance, did not require the helium valve at all, since the gas mixture breathed by the Aquanauts consisted only of nitrogen and oxygen due to the shallow environment (50 ft/15 m). Single Red Sea-Dwellers are exceptionally rare. T. Walker Lloyd, an Oceanographic Consultant of Rolex and a diver himself, personally handpicked professional divers who would receive these watches for testing purposes or as awards. Mr. Lloyd got the job at Rolex after sending a summary of Bob Barth’s conception of the one-way helium valve. Bob Barth is a former US Navy Aquanaut. Some sources claim there are 5 specimen of the Single Red Sea-Dweller, others say 6. I like it precise, so I did my home work, built a comprehensive Sea-Dweller database and tracked down every Single Red Sea-Dweller I could find. There are at least 11 different specimen. 12, if you count the one with a replaced dial. 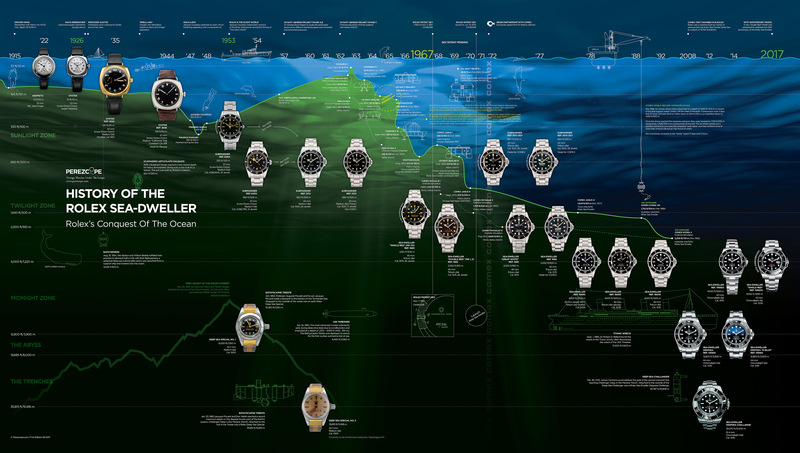 Now, for the first time ever, all 11/12 watches are shown side-by-side. Please click the following picture to enlarge. Let’s start with one of the lowest case numbers known, 1,602,915. This watch has no gas escape valve and belonged to Tektite 1 back up Aquanaut Ian Koblick. In January 1969, Tektite 1 was an attempt of the US Navy and NASA to live and work in an underwater habitat for 60 days. Tektite 1 set a new world’s record for the longest saturated dive by a single team. Ian Koblick participated also in Tektite 2, where, apart from being an Aquanaut, he was support coordinator for site preparation and logistics. The caseback of this watch is engraved with Ian G. Koblick, Tektite 1, 1969. According to Antiquorum, 1602920 belonged to Philippe Cousteau, the son of the famous ocean explorer Jacques Cousteau. Philippe’s watch features a Double Red Mk 1 dial with faded red colour instead of the typical 500 metres dial. Considering the extremely early case number of this watch, it is more than likely that this watch started its life as a Single Red, but received a replacement dial from Rolex. Philippe was a technical adviser and crew member of SEALAB 3. 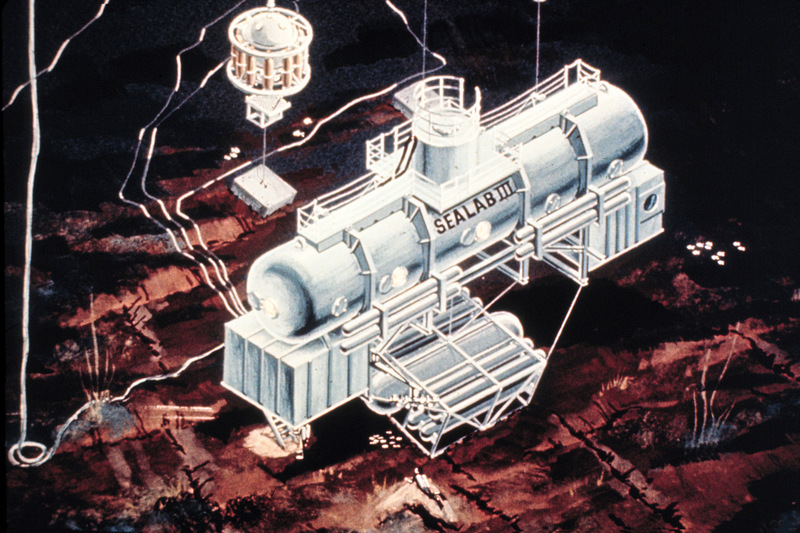 In January 1969, SEALAB 3 was an attempt to live at a depth of 100 fathoms (610 ft/185 m). It is said that all Aquanauts of SEALAB 3 had been equipped by Rolex with Sea-Dweller prototypes featuring gas escape valves. This mission was Rolex’s great opportunity to test the gas escape valve under real life conditions. The program lasted only two days and was abandoned due to the tragic death of one of the Aquanauts. 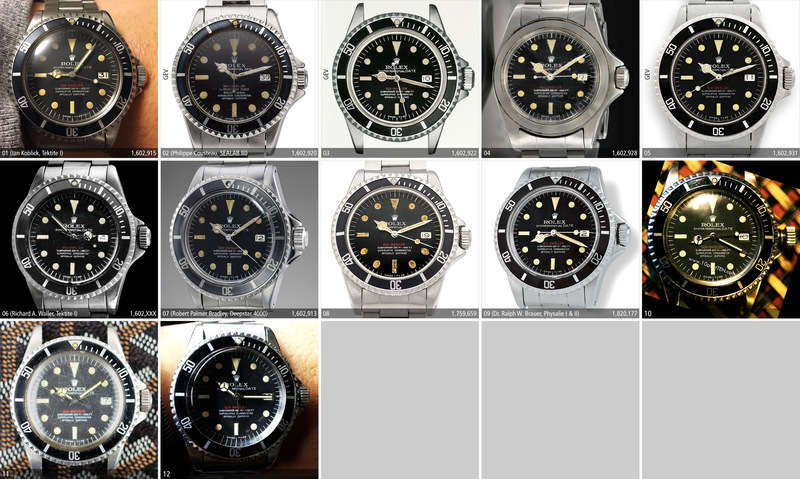 1602922 was published in Mondani’s book “Rolex Submariner Story” from 2009 on page 158. Its case number is only 2 numbers away from Phillipe Cousteau’s watch and it also features the gas escape valve. The caseback has early, hand-engraved Patent Pending engravings. 1602928 was auctioned by Sotheby’s in June 2013 for USD 383,000.00. According to the auctioneer’s website, this watch belonged to an accomplished American diver who started his diving career in the Underwater Demolition Team, the precursor to the Navy SEALs. The bezel was lost on a salvage dive at a depth exceeding 200 metres. 1602931 was auctioned by Antiquorum in November 2012 for CHF 490,900.00. The watch features a gas escape valve and an early Patent Pending caseback with hand engravings. According to Antiquorum the watch came from a Japanese collector. This watch surfaced on the Vintage Rolex Forum in December 2010. The post started with: “I have a Sea Dweller that was given to my Father by the Rolex Co. in 1969 after he completed the longest sustained saturation dive in an underwater habitat called Tektite1.” The caseback of this watch is engraved with “Tektite 1, Richard A. Waller, 2-15 to 4-15-69”. Richard A. Waller was a Tektite 1 Aquanaut who lived in the underwater habitat for 58 days. He and the other 3 Aquanauts established a new world’s record for saturated diving by a single team. 1602913 belonged to Robert Palmer Bradley. Bob started his career a US Navy fighter pilot. In spite of an injury that forced him to retire from flying, Bob was always in search of adventure. He became a pilot of the Deepstar 4000, a deep sea submersible designed by the famous ocean explorer Jacques Cousteau and built by Westinghouse. In November 1968, Rolex presented this watch to Robert Palmer Bradley to commemorate the 500th dive of the Deepstar 4000. 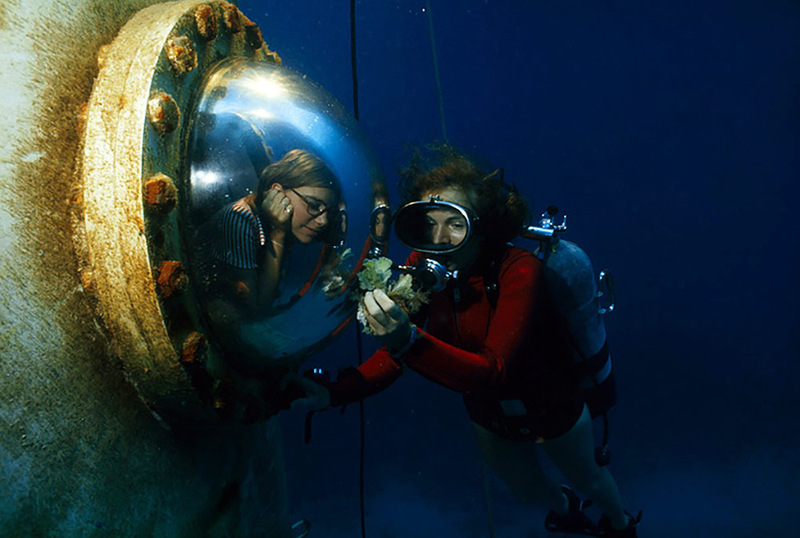 Bob was also known as a marine biologist and commercial diver. He died in a diving accident in November 1973. 1759659 is, in terms of serials, a big step away from the previous watches. Watches in this particular serial range usually feature a Double Red Mk2 dial in combination with a gas escape valve. The present watch has no gas escape valve and the application of the lume is quite remarkable. Latest research suggests this watch was most certainly assembled from loose parts and is not an original Single Red Sea-Dweller. 1820177 is another watch that is quite far away from the rest. This watch, together with a 5512 and a 5513, was found in the late 1990s at the estate of Dr. Ralph W. Brauer after his passing. Brauer was a marine scientist and deep sea diver. In 1968, Dr. Brauer took part in Comex’s Physalie 1, 2 & 3 experiments. Together with Comex founder Henri-Germain Delauze, he descented below 1000 feet in order to find a solution to the high-pressure nervous syndrome that occurs beyond 1000 feet. His watch is equipped with a gas escape valve and an early Patent Pending caseback with hand engravings. This watch was offered by 10 Past Ten some time ago. Apparently it is equipped with a gas escape valve. Another Single Red I found on the web. The crystal of this watch is quite worn, suggesting that the watch was in use as diver equipment. This particular watch has no valve. Watch number 12 is so far the last Single Red I was able to find. This watch has no valve either. It is interesting to see that 5 Single Red Sea-Dwellers out of 12 are equipped with a gas escape valve. Single Red Sea-Dwellers with gas escape valve have casebacks with very distinctive engravings. The following picture compares such a caseback (left) with a later Patent Pending caseback from the 2.1 million range. 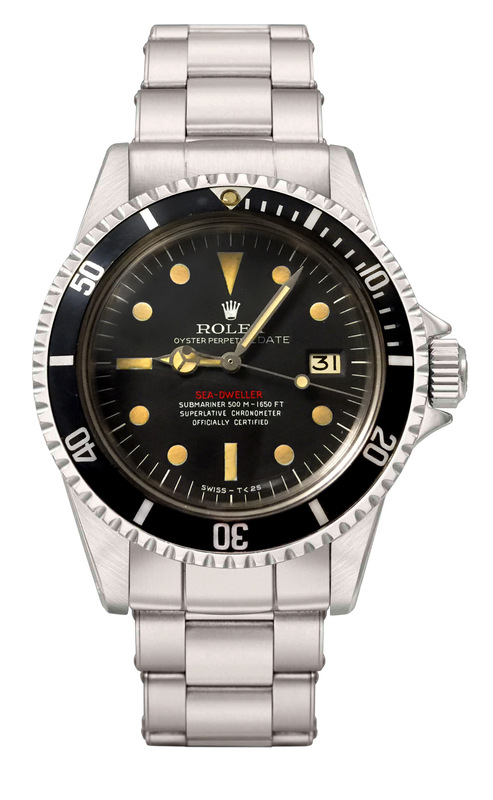 Single Red Sea-Dwellers play a central role in the history of Rolex diving watches. Please click the following infographic to zoom in. Regular: EUR 120.00 plus shipping. Limited: 50 pieces, numbered, signed by Bob Barth in Florida: Price on request. I even went to the crown site, they haven’t this history on the SD page! They should! We may hate or love the brand, but it’s certainly things like this that set Rolex apart. Very interesting, and well done. Reading of this sort is rare: excellent work. Well done, Perezcope! An outstanding summary of the history of the SD’s. From the latest models the 116600 is for me the quintessence of spirit of the SD’s. If I could have only one watch, that would be it. Lovely article, but ‘Deep Sea Challenge’ and ‘Sea Dweller Deepsea Challenge’ are spelt incorrectly on the visual timeline. Thank for your feedback, much appreciated. Will change it asap. I read your article with interest as l have patent pending sea dweller, serial no 17209.. with replaced dial and original box,tags and papers,is this the one your missing?